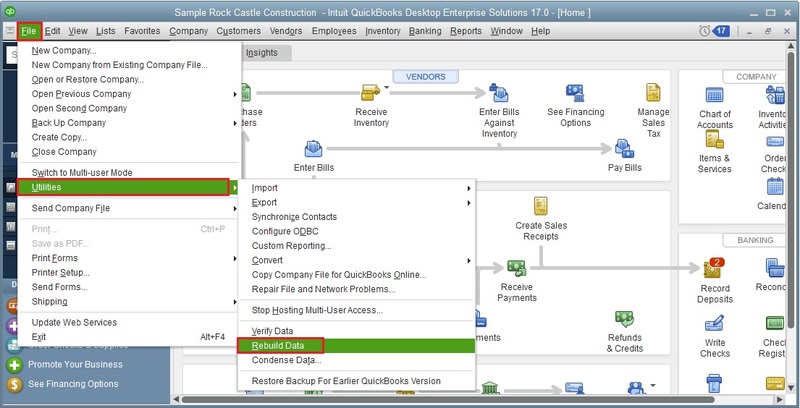 To rebuild your company file via File->Utilities->Rebuild Data in QuickBooks to see if it can fix your issue. What I want to know is how do you automatically rebuild the data file without any user interaction? You can create VB script & schedule it from any desktop based scheduler for example (KA firetask , http://www.konradp.com/products/firetask/). The desktop-based scheduler KA Firetask is not available now. So you can use Z-Cron scheduler (http://www.z-cron.com/download.html) for scheduling job.